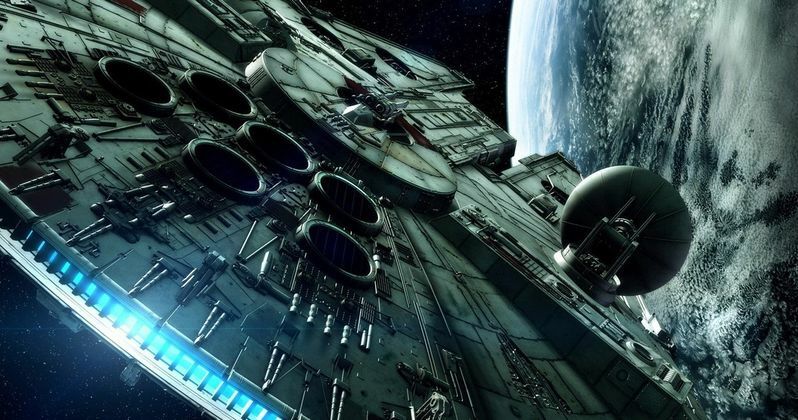 The Millennium Falcon plays a large part in the upcoming Han Solo movie and now Donald Glover has revealed that we're going to see a shot of the iconic bucket of bolts no-one has ever seen in a Star Wars movie. Glover spoke about the Han Solo movie during the Television Critics Association panel for his hit FX TV Series Atlanta, also revealing that his version of Lando Calrissian will wear a cape, which many fans have been worried about since the movie was released. So, fear not, Lando will have an awesome mustache and an even more awesome cape. While speaking at the panel, Donald Glover was asked about his experiences working on the Han Solo movie with Ron Howard. First and foremost, Glover spoke as a fan and was excited to step on to the set for the first time. Glover than revealed that Howard wanted to try and pull off a shot with the Millennium Falcon that has never been attempted before. Donald Glover had this to say. "I remember going on set one of the first times, he was like, 'Yeah, I want to follow you onto the Millennium Falcon and do this thing.' I was like, 'I don't think I've ever seen the outside go into the inside.' He's like, 'Yeah, no one's ever done that shot.' As a fan I was like yeah, I was really excited. I know there's been a lot of talk in the press about this movie but for me anyway, it was a dream and also it looks really cool to me." While the new shot going from the outside of the Millennium Falcon to the inside does sound pretty awesome, Donald Glover also brought up some of the negative press that the Solo movie has had since Ron Howard took over from Phil Lord and Chris Miller during the summer. Many Star Wars fans are worried that the young Han Solo spin-off will suffer the same fate as Warner Bros.' Justice League, which saw Zack Snyder exit the production early with Joss Whedon coming in to finish off the movie. As it turns out, according to Donald Glover, there's nothing to worry about as far as that scenario is concerned. He explains. "Not a lot at all, at least not for me. I think we've all never been faced with anything like that and I think he did a good job of coming and tell us he didn't want to change what we were doing at all. He wanted us to remain confident in our vision. He just wanted to sculpt it in a way." Overall, Donald Glover seems really excited to be a part of the project and was happy when Ron Howard came on board because he was able to get another person's opinion on his portrayal of Lando Calrissian. Glover admits to taking Howard's opinion very seriously because of his history with George Lucas and says that the director was very supportive in every way. Donald Glover even admitted to being relatively stress-free while on set because in most of his other projects he has to wear multiple hats. With the next Star Wars Story, he just got to come on to the set and act. Donald Glover and Ron Howard have been out talking about Solo: A Star Wars Story and it seems that we may have a trailer released by the end of this week on Good Morning America. If the rumor ends up being true, we could possibly get a tease of the never-before-seen Millennium Falcon shot that Glover is so proud of. Solo hits theaters on May 25th, 2018 and we'll get to see the untold history of Han Solo and Lando Calrissian for the first time. While we wait for that trailer to drop, you can check out the rest of what Donald Glover had to say about working on the set of Solo: A Star Wars Story via Slash Film.